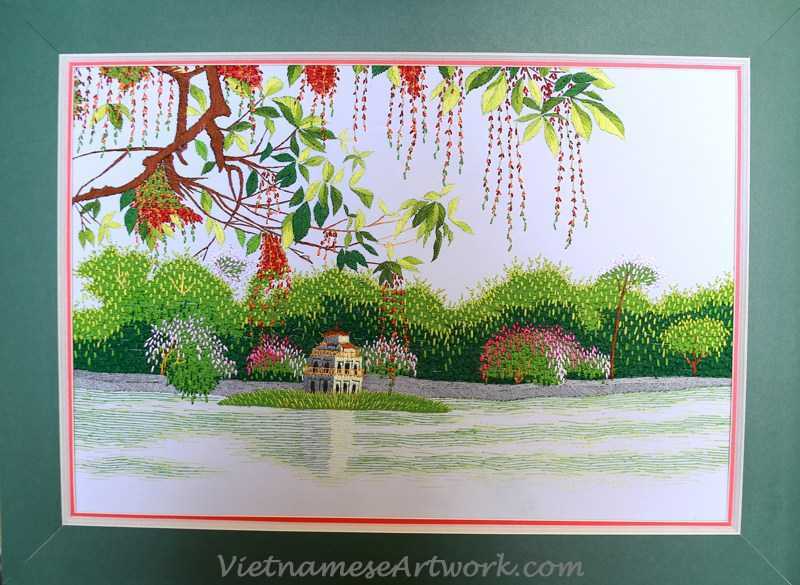 Hoan Kiem lake with flamboyant flowers in summer Hand embroidered painting on white silk Painting size: 14"x 19" Total size with mat: 17"x23"
These Vietnamese embroidery paintings are bought directly from the artists in the rural villages of northern Vietnam where they are made. Embroidery has a long history and is famous in Vietnam. The embroidering trade has been set up there more than 700 years ago. Ha Tay and ninh Binh Provinces are two famous places of embroidery skill trades. These places are where the origin of famous vietnamese embroidery trade come from. There are some families that embroidery skills pass on to generations. Each piece takes a great deal of time to complete. 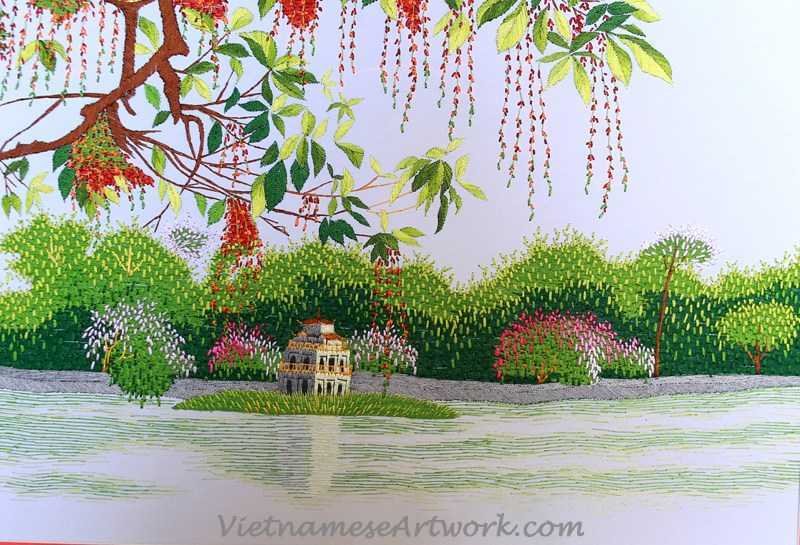 Our large Vietnamese embroidery paintings for example may take over one month for a single artist to finish. We hand pick only the most beautiful silk embroidery artwork having the highest thread count, the most exquisite colors and meeting strict quality standards. It is a shame a picture cannot fully capture neither the beauty of these pieces nor their texture. These cross stitch paintings are not made by painting the colors on the canvas, but by stitching the colorful silk threads on the canvas. They are high quality with vibrant pictures and delicate shades made by fine threads with high density. The process of making embroidery painting requires the artists' patience and talent. In the painting, the artist uses a paintbrush with different colors to make a picture. In hand embroidery, the artists gently and carefully select each tiny thread with different colors and shades. The work requires much more patience than in painting and sculpting. It is even harder in the 3-dimension hand embroidery. The surface of the picture is raised up at different levels to the need to make picture like real. For the scenes like sky in the sunset or the water flow on the river, the finest threads make the paintings natural and give them an harmony touch with nature. This unique technique makes vietnamese embroidery paintings beautiful and original. Many of our customers were first looking for Chinese embroidery or Japanese Embroidery when they discovered our site.